I spotted 2 table top displays of N.Y.C./New York Color cosmetics at Rite Aid earlier this week and picked up a few items. They're on sale right now bogo/50% off, so armed with several $1.00 off coupons and the kind assistance of the cashier who separated everything into multiple orders for the deepest discount, it was a great bargain. 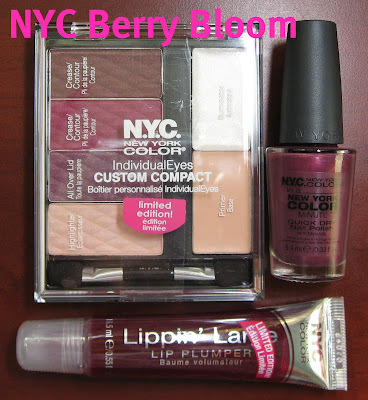 These products are from the Berry Bloom LE collection, and cost me only $4.99 for everything. I also picked up a couple of products from the Sun Soaked LE display, which I'll show in my next post. 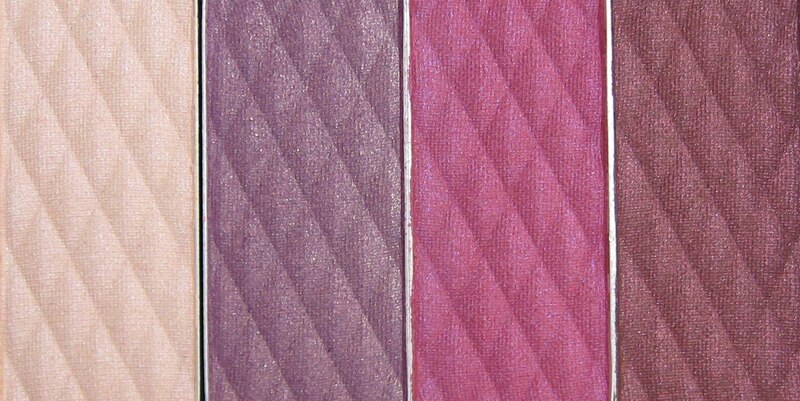 Above & Below: Peony is a rich plum shade with multi colored shimmer. This is shown outdoors, and I used 2 coats for the application. 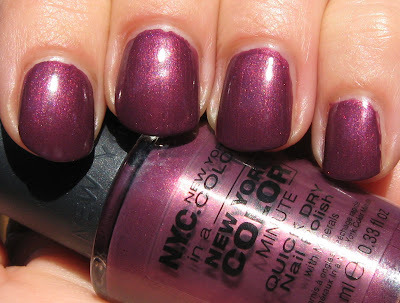 There was one other berry-toned polish in the Berry Bloom Collection. The polishes retail for $1.99. 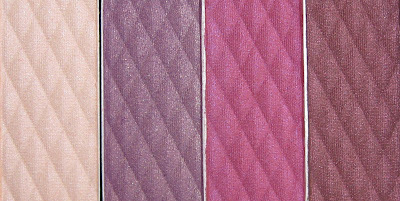 Below: The Individual Eyes/Custom Compact is called Berry Bloom and contains 4 shadows, shade primer, and a creme illuminator. The shadows are shown below. 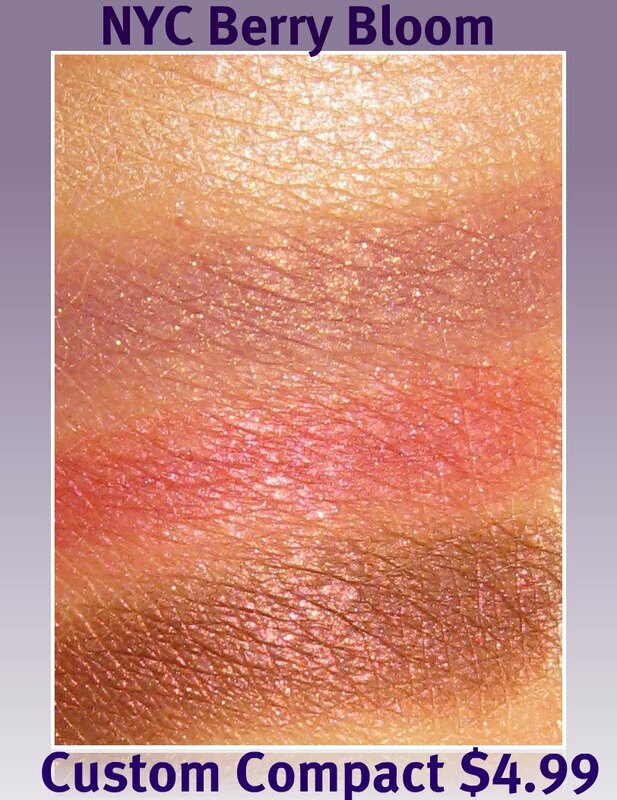 Below: Swatches of the shadows. 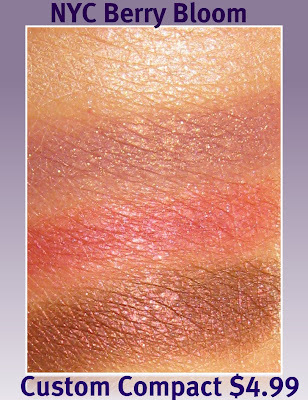 These are fairly pigmented and I'm looking forward to using them, particularly the second and fourth ones from the top. I love the gold sparkle they have. Below: Lippin' Large Lip Plumper is a berry tinted gloss that has a minty/tingly feeling on the lips. The shade is called Mulberry and while it feels nice on the lips, I don't notice any real plumping action going on! This retails for $3.99. There is another eye palette in this collection, along with another polish and a Lippin' Large Lip Plumper. It also contains 2 blush shades, 2 roller ball eye dust products, and 2 lip gloss pot shades with an embossed flower design. I don't have too much from this line other than nail polish, but the shades and pricing appealed to me, so I'll give them a try. Do you have any cosmetics from N.Y.C.? If so, what do you think about them? Ooh, I really like that polish...perfect for fall. Lovely shade of plum. I have about 20 or so of this brand. Like the polish. Can't say how good it is. I usually get chips with everything! I have a habit of hitting my nails when I was my hands. Bang the nail right into the faucet! Idiot. I haven't tried their makeup. Love plums but sometimes they don't love my super dark circles. I've never yet gotten any plumping action from a lipstick or gloss. They just irritate your lips. Wish they did work. I need it on my upper lip. But I love your bargain haul there...I just wish I could find more coupons! They didn't have this at my RIteAid must look again, gorgeous. I'm in LOVE with that nail polish colour. I love their creme blush sticks and their new glosses that look like pixi sticks. That nail polish is a lovely fall color.